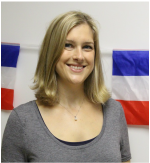 My name is Juliet Orchard and I am an experienced French and Spanish teacher . I have created the Language Classroom so that I can share ideas and resources for teaching and learning with other educators. My goal is to challenge and motivate learners to raise their levels of achievement, and within these pages I hope that you find strategies to engage your students as strong thinkers and communicators. All of the photos you will see are from my own classroom and displays, and many of my resources are available to download here at Teachers Pay Teachers. Please share any of your feedback or comments with me on the blog pages, or alternatively email me at orchardjuliet@gmail.com. ﻿The Comprehensible Classroom﻿ offers a wide range of TPRS resources. The texts provided are culturally rich and offer multiple opportunities for students to improve their reading skills. Grammatical structures are provided in context and many of the texts and resources allow students to discover grammatical rules for themselves, instead of through explicit teacher instruction. Señor Woolly aka Jim Wooldridge provides some weird and wonderful songs (or, as he likes to call them, stories) to help students learn topic-based vocabulary as well as grammatical structures. The songs are extremely catchy and students will leave the classroom with the lyrics stuck in their heads, guaranteed! He also provides work packet resources containing the lyrics, puzzles, comprehension questions and much more. The French Corner provided many engaging ideas for classroom activities. I like the simplicity and effectiveness of the ideas on this site. Mary Glasgow was originally provided as a magazine in the UK for young people learning languages. It is now also a website full of culturally rich texts and videos for French, Spanish, German and English. The videos are perfect for assessing MYP criteria A.
DuoLinguo is a must have website and phone app that all students should have to support their learning outside of the classroom. My students have benefited from regular practice with this app. The Creative Language Classroom is just as its name describes it. This website is full of creative resources for the classroom and a lot of their ideas and activities have a focus on authentic, real world exposure and use. I am a passionate educator and language specialist. I have taught French, Spanish and Chinese for 13 years in the UK and in China. I have experience of teaching GCSEs as well as the IB DP and MYP. Find out more about me within these blog pages or below at LinkedIn.